OVERVIEW: The Amana ACD2234HRW side by side refrigerator did an excellent job keeping a constant temperature. It has a lot of nice features for the price range as well, but we were somewhat surprised by the lack of a few things that you would expect to see in a side by side refrigerator. First off, the fact that it has two veggie crispers but no meat drawer seemed a bit odd. A can rack seemed to be one feature that would greatly enhance what is already a well designed interior space. But, those faults aside, it ran quietly and proved to be one of the better Amana side by side refrigerator models. 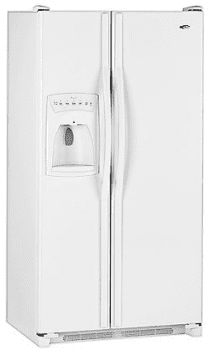 Amana ACD2234HRW Side by Side Refrigerator is a beautiful fridge. We love the way the ice and water dispenser just blends right in! STYLE: The styling of this model was nothing extraordinary and we felt was adequate for the price. It's rather modern and sleek and we feel it will blend nicely with just about any kitchen decor. CAPACITY: This Kenmore Fridge Freezer has a 21.6 cubic foot interior which is smaller than most in the side by side category, but the unit makes good use of the space it has. The flip down door baskets in the freezer and the gallon storage door compartments in the fridge help make up for the difference. NOTABLE FEATURES: This unit has freestanding cabinet depth which will allow you to fit it into most coventional kitchens as is. The Frontfill Dispenser is well thought out considering it has a child lock out, a filter status indicator (which lets you know when to change it out) and an Auto Night Light. The slide out wire freezer baskets came in quite handy. One thing we didn't like was there was no difference in humidity levels in the garden crisper or in the deli drawer. EFFICIENCY: It’s ENERGY STAR qualified. DIMENSIONS: Its dimensions are: DEPTH –29 1/4 in, WIDTH – 35 5/8 in, HEIGHT 68 1/2in. MSRP: The actual MRSP varied from $1,819.00 to $2,089.00 depending on the color (the stainless steel being the most costly). Though this refrigerator has been discontinued and is no longer being sold as a new model.